I'm sharing some inspirational blogs and ideas to get you ready for Lent with your little ones! My children look forward to the Advent and Lent seasons, as they are times for family traditions and spiritual growth. I'll be honest, as a kid, I didn't look forward to Lent and I didn't really even know what Advent was. In comparison, my own children cannot wait for Advent and Lent, and I'm really glad for it. I feel blessed that I am able to be a stay at home mother, and share the beauty and richness of our Catholic faith with my children. One forum where the ladies never cease to inspire me is the 4 Real Learning forum. I especially visit the discussions under the heading: Domestic Church, for ideas and inspiration in celebrating the Liturgical year in our home. Through this forum I've found wonderful bloggers such as Meredith at Sweetness and Light, Jessica at Shower of Roses, Lena at Joy Filled Family, Lacy at Catholic Icing, Charlotte at Waltzing Matilda, Jen at Wildflowers & Marbles, Anne at Under Her Starry Mantle, and Jennifer at Family in Feast and Feria, and so many more that inspire me. You can check out their blogs to see ideas on how their family observes Lent in their home. This is one of the many things we do to show the children that we are on a 40 day journey with Jesus during Lent. At the end, there is the joy and sweetness of Easter. 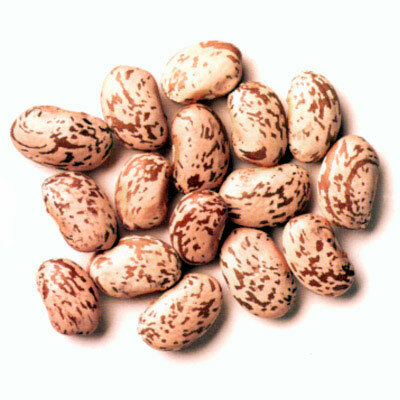 The grit before the glory, the pinto bean before the jelly bean! 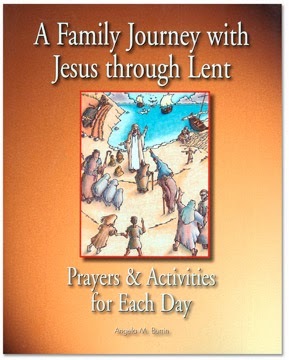 Daily readings from the book: A Family Journey with Jesus through Lent. The kids absolutely LOVE this book from Catholic Child, as it speaks from both the perspective of a child living during the time of Jesus, and from Jesus giving a special message to the children. There is also a "Scripture Memory Verse" for each story, and my children love to repeat it and see if they can memorize it. We are using these 8x10 posters of Vincentini's depiction of the Stations of the Cross to meditate on our Lords Passion along with a Stations of the Cross for Children type book. Till His spirit forth He sent." For all the lyrics in both English and in Latin, check out CatholicCulture.org. I'm loving this "14 Stations of the Cross Candle Activity" from Just Another Day in Paradise. It is such a simple and touching idea. We are also enjoying this Printable Lenten Calender from Catholic Icing. 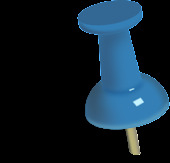 Check out Catholic Icing for more great ideas to do with your children during Lent and all through the Liturgical Year! Along with all the activities above, we are also keeping a sacrifice jar. Every time the children make a genuine sacrifice and offer it up to God we put a bean into the jar. 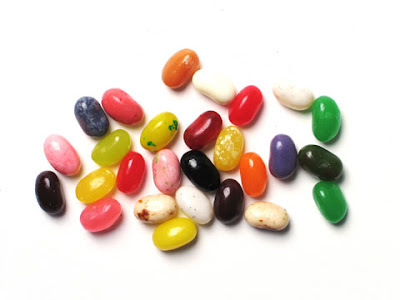 On Easter morning, all of the beans will have turned into jelly beans! The sweet reward after all the sacrifice during Lent! Check out this great idea called "40 bags in 40 Days" blogged by Jessica at Shower of Roses. It is a great way to involve the family in making a sacrifice to detach yourselves of material things, and reduce the clutter while doing. If you can donate your stuff to someone in need, than Great! Even better! Also be sure to check out Jessica's "Jesus Tree" posts with daily scripture readings and ideas. Finally, Check out Holy Heroes Lenten Adventure. The kids will be sure to love the videos, games, coloring sheets and ideas! 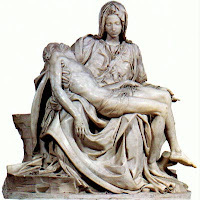 Our kids love listening to their Stations of the Cross CD as well as the Sorrowful Mysteries, especially during Lent. 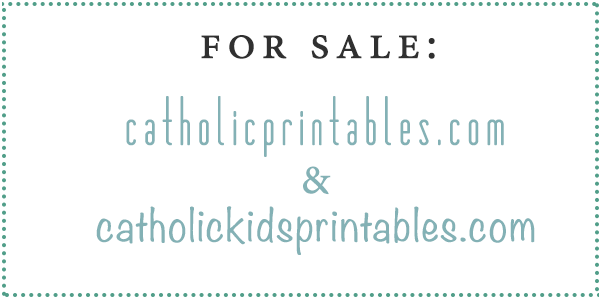 Want to teach your little one's about the Catholic faith the Montessori way? Check out Elizabeth Papandrea's Catholic Montessori album! Feel free to shoot an email to montessoricandy at gmail dot com if you are interested in making an offer on these domains!